Earn up to 4,392 reward points. Push the limits of size and power with the latest addition to the Aguilar family. 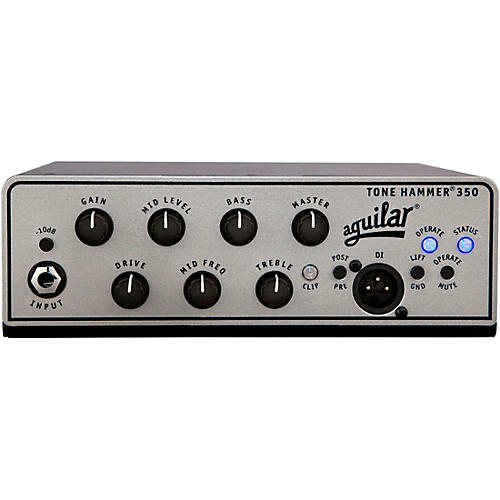 Brand new for 2012, the Tone Hammer 350 makes a big sound but leaves only a tiny footprint! Easy to purchase as well as easy to carry, players on a budget can now have it all! This amp has the sound, the look, and it's assembled at the Aguilar factory in NYC along with all of their legendary bass heads. The Tone Hammer cranks out 350 watts of solid state power. Drive Control: Fully adjustable, featuring Aguilar's proprietary AGS (adaptive gain shaping) circuit. Start cranking it to 10 today!